We’re delighted to bring you a snapshot of these stories – here’s what five heads of schools had to say about what ISTA’s means to them. My first experience of ISTA coincided with my joining the International School of Luxembourg – a school which I soon learned already enjoyed a long and productive relationship with ISTA over the years. And what a wonderful relationship and creative community I discovered. It was actually a copy of Scene which first drew my attention to ISTA with all the brilliant, creative projects, productions and people proudly displayed within its pages. Little wonder that this exuberant and full-of-life magazine is in its fifteenth year of production and here we are celebrating its 55th issue. Congratulations! I subsequently became aware of the beating heart of the organisation itself when our school’s theatrical guru Mike West put forward a request to have our drama students and teachers join with theatre students, teachers and experts from other international schools from far and wide in what, naturally, turned out to be a wonderful learning and performing experience for all concerned. The next step, of course, was to host our own event at ISL with a marvellous group of students and teachers joining us on our own turf for days of outstanding learning, performance, talent showcasing, companionship and fun. I was totally sold. Such an enriching experience for young people and such impressive displays of talent, confidence and full-blooded enjoyment. And not just the kids. Over the years I continued to be impressed and delighted with the opportunities ISTA provided for our students; not only allowing them to explore, grow and show their considerable and varied talents but to encourage and enable them to develop such a powerful and crucial range of transferrable life skills: self-confidence, self-discipline, time management, listening skills, following instructions, teamwork and development of clear speech and diction. Quite a package. It was always a pleasure to see students making and enjoying new acquaintances from all around the world and, especially in these days of social media, it would be interesting to know how many life-long friendships have resulted from people being drawn together at ISTA events and continue to do so. As an educator, I was also constantly impressed with the contribution theatre made to so many student’s overall education. We often saw individual students steadily blossom out of shy cocoons as they found a niche for their (sometimes previously unrecognised) talents; sometimes ultimately in leading roles. And then there were always the highly academically capable individuals who were up to their necks in everything: studies, sports, drama and music, and somehow finding time to shine all round. I must admit I always had a sense that for such busy and successful students, theatre provided a pressure valve and a creative lubricant which only helped them with their academics. No surprise then that it is such a pleasure to read and absorb the contents of Scene when it arrives. Always a refreshing affirmation of the way in which theatre enriches and brings such pleasure to our lives, either in performance or as a member of an appreciative audience. During the past 30 years since its founding the International Schools Theatre Association (ISTA) has grown to include 220 member schools and runs approximately 50 annual performing arts events worldwide. However, ISTA has only one permanent performing arts academy: the ISTA Performing Arts Academy Shanghai at the Western International School of Shanghai (WISS). Though I know all of that now as the director of WISS, I did not know any of that at the beginning. My first experience with the ISTA Academy at WISS was as a parent. My oldest daughter Alexcia loved to sing and she especially loved to dance. She was in the WISS Community Choir and took many, many hours of after school dance classes but that just was not enough. We enrolled her in the inaugural course of the ISTA Academy. She loved it! She not only worked on her performing skills but, most importantly, collaborated with younger and older students as they created unique work. After the 8-week long course I attended the final performance with a theatre full of parents and guests, and was amazed by what the group created in such a short period of time. I was so proud of her and of them! Once the applause calmed down, the students were taken away to reflect on their experiences over the course while the audience was given a summary of what had occurred behind the scenes over the weeks. I became even more amazed with the professionalism and creativity of the practitioners as they supported the students during the process. After seeing what her older sister did in the group’s culminating performance, and once she turned 11, my youngest daughter Alana decided to enrol as well. Seeing how my daughters were growing in the Academy, I started to learn more what the ISTA Academy at WISS was about and what an unbelievable opportunity it was for all of the students at the academy. The ISTA Academy at WISS has incredible patrons who have worked with our students to include Emmy, BAFTA, and ASCAP-award winner John Altman, multiple Grammy-award winner Andy Summers, Double Oscar Academy and multi BAFTA-award winner Neil Corbould, actor and award winning director Ian McElhinney, award winning playwright and actress Marie Jones and many more. The ISTA Performing Arts Academy Shanghai at WISS is run by four of WISS’s extremely gifted teachers each with different specialisations to include drama, movement and choreography, theatre tech and music. At WISS, we take the performing arts and the ISTA Academy very seriously. That is why when one of our performing arts teachers/ISTA practitioner teachers moved on to another challenge, creating an opening in our preforming arts department, I prioritised candidates with experience leading ISTA workshops around the world as ISTA for me is the mark of quality, the best. We are thrilled that WISS is home to ISTA’s only full-time performing arts academy and are extremely thankful for the many opportunities the academy provides to students from around Shanghai and beyond. I first learned of ISTA in 1992 while teaching at Taipei American School (TAS). While at TAS I was invited to accompany middle school drama club sponsor Nancy Mock on an ISTA trip to Thailand. Together we travelled to the International School of Bangkok (ISB) with a young and eager troupe of students. For me that trip was signature-special. It offered the classic ISTA weekend full of experiential learning, inspiring all of us with great workshops, presentations and creative ensemble work. Throughout the week-end the spirit of innovation and discovery was alive. Through the years I attended other ISTA events in Brussels, Milan, Cairo and Taipei – all these trips gave our students a special experience with other young talents and allowed each student to thrive in a remarkably nurturing and risk-friendly environment. What is it about ISTA that ultimately changes lives? It’s risk. It’s safety. It’s exploration, collaboration and play. Ultimately, it’s a formative learning experience which allows students individually and collectively to make discoveries about many things. Most significant perhaps is that students are empowered to discover their own values and beliefs, and to more fully develop their identities. How does it happen? Students and their sponsors from international schools arrive at the host school. Talented professional artists/educators fly in to lead the workshops and the ensembles. The workshop/ensemble leaders create the atmosphere. As ISTA aficionado Fenella Kelly describes it, the participants are all invited into a “3rd space”. That is a space in which they can dare to be someone else. They can explore, experiment, take risks. They can mimic, rift, innovate and connect. Students are drawn to this world of the 3rd space and in it they come to understand its transformative power. In my 30th year as an educator, students are still returning from ISTA experiences with the same enthusiasm and advocacy I have witnessed in each of the five schools I have served. The ISTA learning experience is formative and transformative. Long live ISTA and may it continue to flower: ISTA vivat crescat floreat. I first came across ISTA when I was a principal at an international school in Hong Kong. The drama teacher at our school asked to take a group of students to a festival in Shanghai. When the group returned they asked if they could have a spot in an assembly and I was happy to oblige. That assembly was the first time I began to appreciate the possibilities of the ISTA approach. The students performed a Bear Dance and at one point managed to coax a sizeable group in the audience to join them. The students performing the Bear Dance had been a reticent, self-effacing group before they went to Shanghai but the experience had obviously changed them. They had a newfound confidence and voice, and they were encouraging others to follow their lead. Our school had no culture of drama in school and many of the classes were unusually quiet with students reluctant to share their opinions and used to a very traditional behaviourist sort of pedagogy: students in line, lots of teacher talk, short answers, quiet students. The move to inquiry was proving a slow battle of attrition and the Bear Dance moment was one of the turning points in that battle. It was the first time I had seen students confidently taking control of an assembly, showing their authentic voice. That was the moment I began to think of ISTA as more than a drama organisation but one capable of impacting on whole school culture for the better. We hosted two ISTA festivals in Hong Kong both of which were hugely popular with parents and students. We are now hosting our first festival at my new school (ILS Surrey) and I am always looking to develop new and innovative partnership programmes with ISTA. The starting point for this year’s festival is the Good Chance Theatre set up for migrants in the Jungle refugee camp just outside Calais. It aligns with the service projects we are running around the rights of refugees and is a perfect illustration of the flexibility of the ISTA approach. There is an urgent need to reassess the place of the arts in schools and the ability of the arts subjects to inform practice across disciplines. Students should have the opportunity to perform their understandings in different ways through different use of different medias. Students learn in different ways and have different passions. ISTA’s focus on devised theatre nurtures students’ creativity and allows any student, whatever their ability, to develop skills for life. A creative and dynamic approach to pedagogy enables students to find their voice but many teachers do not have the toolkit to create the kind of dynamic classroom befitting an individualised approach. ISTA is far more than a drama organisation. It can provide the very toolkit teachers need in the modern world. It is my pleasure to share some of the ways in which ISTA has supported our school’s desire to offer a quality theatre arts programme. Bali Island School (formerly Bali International School) is a small school with single digit cohorts of DP Theatre students and a strong MYP Drama programme. The school strongly believes in supporting the arts but it can be difficult to offer a comprehensive programme when we consistently have small theatre arts cohorts. It is with this challenge that ISTA helps us make a difference. Since we became part of ISTA, our students have participated in theatre events most notable in Kuala Lumpur and more locally in Ubud, Bali. Our drama teacher Monica Coburn is a strong proponent of ISTA. 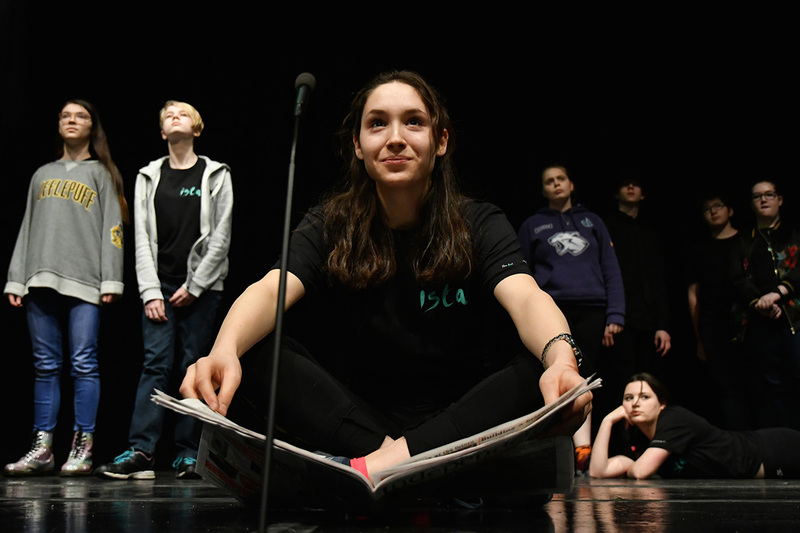 She states ISTA’s “TaPS offers our students a great opportunity to work in an ensemble with accomplished local and international theatre practitioners. The schedule is always richly packed with cultural and theatrical experiences. Our students have found it to be a tremendously empowering experience to share perspectives with a peer group that is passionate for performance and to contribute to the inspiring exchanges of theatrical ideas and collaborative artistic efforts.” Since we have such small cohorts, we also have a small drama department consisting of a single teacher. Therefore, the access to professional development that ISTA provides through the community, networking and the green room portal are invaluable to us. We also regularly take advantage of the professional development opportunities for DP Theatre. When we are unable to actually attend events, we still benefit from receiving Scene quarterly. Monica takes inspiration from the journal and uses it to inform her lessons and try new ideas. Both professional development opportunities are appreciated by BIS as we look for ways to continue to grow professionally and stay within our budget. These professional development opportunities mirror the TaPs advantages of sharing perspectives and exchanging ideas for our teacher. Therefore ISTA provides us with the “complete package” of both professional support and support of student learning. This is a rather unique and very much appreciated aspect of ISTA. Monica has always strongly advocated for our participation in ISTA and as a head of school I take the endorsement of valued employees very seriously. This shows that ISTA makes an impact where it counts: with the teaching and learning in our school. BIS has been part of the ISTA group for many years and plans to continue to be part of the community for many years to come.